SYDNEY, Australia -- Actor Johnny Depp's wife Amber Heard pleaded guilty Monday to providing a false immigration document when the couple brought their two dogs into Australia last year, but she managed to avoid jail time over what was dubbed the "war on terrier" debacle. 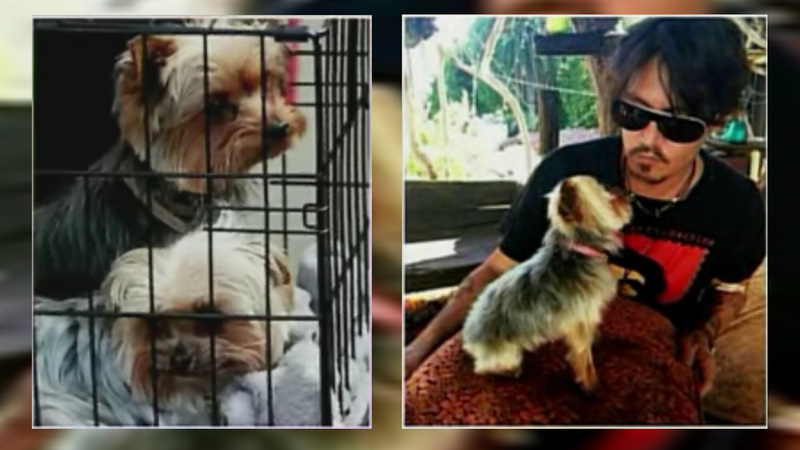 Prosecutors dropped more serious charges that Heard illegally imported the Yorkshire terriers, Pistol and Boo, into the country while Depp was filming the fifth movie in the "Pirates of the Caribbean" series. A conviction on the two illegal importation counts could have sent the actress to prison for up to 10 years. "When you disrespect Australian law," Depp says in the video, "they will tell you firmly." "If we start letting movie stars - even though they've been the sexiest man alive twice - to come into our nation (with pets), then why don't we just break the laws for everybody?" Joyce said at the time. "It's time that Pistol and Boo buggered off back to the United States." Depp himself poked fun at the drama during a press conference in Venice, Italy, last year where he was asked if he planned to take the dogs for a gondola ride. "No," he replied. "I killed my dogs and ate them, under direct orders from some kind of, I don't know, sweaty, big-gutted man from Australia." Prosecutor Peter Callaghan said ignorance and fatigue were no excuse. "The laws apply to everyone," he said.